How to insert a table/row into a Wordpress blog post or page. Home » How to insert a table / row into a WordPress page. How to insert a table / row into a WordPress page. These days we try to avoid using HTML tables for layout purposes but there are times when a table is absolutely the right answer, for example when laying out a set of data points, pricing information or other structured data. Yesterday I was helping my son with a blog post using WordPress and told him to insert a table only to find that by default these days the WordPress editor doesn’t actually have an Insert > Table or Insert > Table > Row function. We were in a hurry at the time and we needed to get the job done so I just popped into the HTML view and entered the code. I’m happy to do this as I’ve been writing HTML and the like since the dawn of time… but it’s not acceptable or a great experience for people starting out or those who just don’t want to get into that detail. 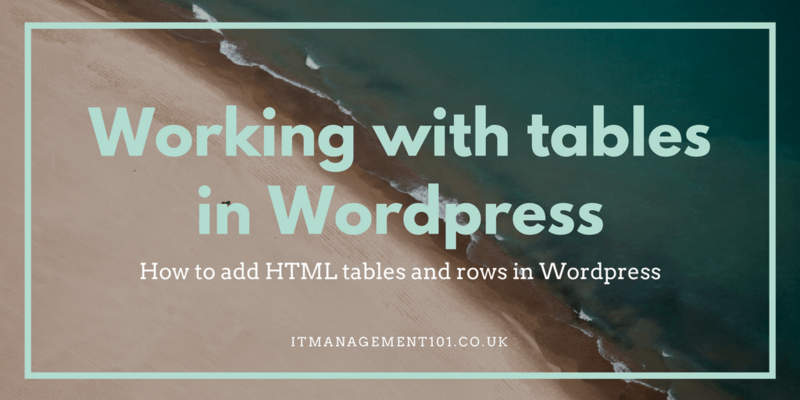 Today I’ve had a bit more time to research this and I’ve found that the WordPress Insert Table and WordPress Insert Table Row editor functions can easily be added back via a very popular plugin. This graphic shows how to locate the WordPress Table Editor plugin. To add the WordPress Table editor function, click on Plugin’s on the left hand navigation menu. Then in the keyword search box in the top right enter “MCE Table Buttons”. You should then see a plugin called “MCE Table Buttons” (shown here top right). As you can see it’s very popular with over 100,000 active installations. Just click the Install Now button and then activate the plugin. This graphic shows the WordPress editor after we have enabled the Table Editor functions that allow you to add tables, columns and rows to your HTML tables in WordPress. Once you have installed the MCE Table Buttons plugin you will then find the missing Table Editor button in the WordPress Editor. If you have any questions about HTML tables or using the Table Function in the WordPress Editor just leave a question in a comment below and I’ll try and get straight back to you.